= Nee watashi no koto aishiteru? = Hey, do you love me? = Suki? Kirai? Hakkiri shite! = Do you like me or not? Which is it?! Today we will learn how to express LOVE ♥ in Japanese. Love in Japanese is 愛 = あい = ai. = Watashi wa anata wo aishite imasu. •「愛してる。」( = Aishiteru) Love you! •「愛しているよ。」( = Aishite iru yo) This sounds a bit boyish. •「愛してるよ。」( = Aishiteru yo.) This sounds a bit boyish. 「愛しています 。or 愛してる ( = Aishiteru or Aishiteru) 」( = Aishite imasu.) is a very heavy and special phrase. We use 好き です ( = Suki desu) much more often than 愛しています( = Aishiteimasu) or 愛してる(=Aishiteru). = Anata no koto ga suki desu. = Anata no koto ga suki! This sounds a bit girlie. Note : They both mean “I like you. /I am fond of you.”→“I love you.” It is very common to add ~のこと ( =~no koto) after a pronoun to refer that person. あなたが好きです。 ( = Anata ga sukidesu.) sound very straight. = Anata no koto ga shinyou dekinai. = I can’t trust you. = Kare anoko ga sukinan datte. = Kare anoko no koto ga sukinan datte. = They said he liked her. / I heard he liked her. あなたのことめちゃめちゃ好き！( = Anata no koto daisuki!) sounds a bit girlie. As in English, this is not just for romantic relationship. Kids and parents also say this to each other “I love you”, using 好き ( = suki). They almost never use 愛してる ( = aishiteru) face to face. = Mama no koto daisuki! = I love you, Mom! / I love my mom! = Otousan, watashi no koto suki? = Dad, do you like/love me? I know it all depends on the couple but compared to westerners, we don’t say 「愛しています 。(or 愛してる)」( = Aishite imasu / Aishiteru)) , “I love you!” face to face in daily life so much. = Kotoba ni suru to karuku naru / yasuppoku naru. = If you say something (so often/casually) it will become cheesy. !yellowflower! So when do we say “I love you!”? ★We say it when we tell someone “I love you!” for the first time, confessing our love. I confessed (my love) to him. = He hit on me. = I made a pass at her. ★Younger couples are not so shy about expressing their love. = I really like/love you! They say it or text it to their sweethearts more casually. ★Also when we see our own feeling of love objectively and refer to it, we use the “L” word. = Kare wo kokoro kara aishite imashita. = I loved him from the bottom of my heart. = Kanojo wo hontou wa suki de wa arimasen deshita./ Aishite imasen deshita. = To be honest, I didn’t like/love her. = Boku niwa kanojo ga imasu. = I have a girlfriend. = Watashi/Boku niwa tsukiatte iru hito ga imasu. Young people stress the ending sound. ★Or when you accuse your sweetheart of becoming cold! = Watashi no koto mou aishite naino? = You don’t love my anymore? = Boku no koto sukitte itta no ni uso datta no? = Were you lying when you said you loved me? = Anata ga zutto suki deshita. = I’ve always loved you. = Anata wa watashi ni totte taisetsu na hito desu. •大切 ( = taisetsu) literally means “important”. = You are very special. = Anata no koto wo taisetsu ni omotte imasu. = I care about you. = Watashi ni wa anata ga hitsuyou desu. = Kimi (Anata) to zutto issho ni itai. = I want to make you happy. = Zutto soba ni itai. = I want to be with you. •側 ( = soba) literally means “next to” or “close to”. = I want to protect you forever. They are all a bit corny and cliché. あっま〜〜い！( = Ammaaai!) , How sweeeet! ( →甘い = amai = sweet) Too sweet! くさい( or クサイ）セリフ（ or 台詞）！( = kusai serifu) The original meaning of くさい = 臭い (= kusai) is stinky or smelly. = I am in love with (someone). = Maggie wa Jun ni koishite iru. = Maggie is in love with Jun. = Maggie wa Jun wo aishite iru. Note: Careful not to say 愛人 ( = aijin). 愛人 ( = aijin) is someone — male or female — you are having an affair with, like a mistress, etc. = Watashitachi wa koibito doushi desu. = We are a couple. = Watashitachi wa tsukiatte imasu. = We are seeing each other. = Anata wa watashi no hatsukoi no hito deshita. = You were my first love/crush. = Ano futari wa ren’ai kankei ni aru. = They are in love. = Mou kanari nagai aida ren’ai kara touzakatte iru. = I haven’t had a relationship for a long time. = Karera wa koinaka da. = They have a romantic relationship. Sometimes we change the titles of western movies completely and replace them with some catchy Japanese titles. There are many romantic movies that use the kanji 恋 ( = koi) in their titles. Can you guess the original movie title from the Japanese titles? = I’m in love with her. Osaka dialect. This phrase became popular last year when one comedy duo started to use it as their punch line. = Maggie wa kataomoi wo shiteiru. = Maggie has a crush on someone. = You guys are lovey-dovey! = Karera wa atsui naka da. <おまけ> ( = Omake) Bonus! Are you in love now? Then here are some useful phrases to get closer to that person you like. In Japan, when we like someone, we often ask the person out subtly. First of all, ask for their email or phone number. = Meiru adoresu(meruado) koukan shinai? = Do you want to exchange email addresses? = Denwa bangou kiitemo ii? =Do you mind if I ask your phone number? = Hima na toki ni renraku kureru? = Can you contact me when you are free? Then ask them out. Check to see if they are interested in going out with you alone. = Do you want to go out with me sometime? / Do you wanna go out with me sometime? = Kondo no nichiyoubi aiteru? = Are you free next Sunday? = Kondo eiga demo mini ikanai? = Do you wanna go see a movie sometime? = Chotto oishii mise ga arundakedo kondo issho ni ikanai? = I know a good restaurant. Do you wanna go there with me sometime? = Kondo dokoka ni tsurete itte kurenai? = Kondo dokoka ni issho ni deeto shinai? =Do you wanna go on a date sometime? = Ima tsukiatte iru hito wa imasu ka? = Are you seeing anybody? = Futari de dokoka ni shokuji demo ikanai? = Do you wanna go somewhere — just the two of us? If someone asks you out, it is obvious that they like you! And if you ask someone and they say ちょっと. . ( = chotto…) go check my ちょっとlesson, immediately! = Do you wanna go out with me sometime? = Kare to deito suru. = I have a date with him this Sunday. = to go on a drive on a first date. 交際宣言 ( = kousai sengen) an official announcement to tell people they are officially seeing each other. = Tsukiatte iru hito ga imasu. = I am seeing someone. = Tsukiai hajimeta bakari dakara dounaru ka wakarimasen. = I have just started to see someone so I don’t know what is going to happen in the future. = Watashi/Boku to otsukiai shite kudasai. = Watashi/Boku to tsukiatte kudasai. = Go out with me, please. = Yokattara watashi/boku to tsukiatte kureru? = If possible, will you go out with me? Or are you more serious and thinking about marriage? = Seishiki ni tsukiatte kudasai. = Please go out with me officially. = Kekkon wo zenntei ni otsukiai shite kudasai. = I would like to have a relationship with you with the object eventually being marriage. = Do you like me or not? Make yourself clear! = Nihongo deno ai no hyougen wo oboemashita ka? Soredewa dareka watashi ni ai wo kokuhaku shite mite kudasai. = Did you learn how to express love in Japanese? So, who is going to confess their love to me in the comments? Will you be my Patron? 謙遜 ( = kenson) : How to sound more humble in Japanese! Also, thank you for all the knowledge! I have one question! My boyfriend of 5 years and I love to call each other “my love” how would we say that in Japanese? Is there such a word/phrase for it? Me) Thank you for doing that for us! BF) You’re welcome, my love! Thank you for visiting my site. I am glad to hear you like reading my site. I am afraid to say you don’t use the terms of endearment such as “my love” / “babe/baby”/”sweetie” /”honey” in Japanese. People might refer to one’s partner ハニー ( = honey) and ダーリン (darling) but they don’t say 私の愛・恋 ( = watasi no ai / koi). You might see 私の愛しい人 (= watashi no itoshii hito) for my loved one in the literature but I doubt people use it verbally. How sad it sounds, but Maggie’s right. I don’t know, if you know, that あなた might also be translated as “dear”. I know… We have to create new words! I might have mentioned in my あなた lesson but you might hear that usage in drama or animations but it is a bit old fashioned. Maggie-sensei, thank you so much for this lesson! Actually I want to ask the difference of grammar, but it’s about love expression so I hope it’s not really out of context. Usually I found either 君が好き or 君を好きになった, but recently I found this sentence 超美少女が好きになったのは、超能力者。 I take it’s 超能力者 who fell in love with 超美少女 rather than the other but it might be because of the comma that I’m not really sure. And when I searched for other examples, looks like (object) が好きになる is used but not as frequently as (object )が好き or (object)を好きになる, did I guess it right? But aren’t their meanings all the same ? The one who A fell in love with is B. The one who fell in love with A is B. As you said, comma is a key to tell which one is which. First ~が好き and ~が好きになる are different. I can’t tell which one we use more but が is a topic marker and を is an object marker. Therefore, while が emphasizes who you like and を is used when you state the fact you like someone. I’m sorry for commenting on this rather old article, but there is something I would like to learn from you. There is this Japanese girl I have deep feelings for. Ich know that she also likes me a lot, but I can’t figure out how much exactly. However, I am confident, so I want to propose my love to her. Should I say “(name) wo aishiteru yo”, or is it too heavy? If so, were I to use “(Name) ga daisuki da yo” instead? Doesn’t it make a difference if I left out the “ga” before her name (I’ve also read that several times)? It may sound strange but “Boku wa ~ no koto ga suki desu.” sounds deeper than “daisuki”. FYI “koibito” is fine but you use “kanojo” more often in Japanese. “Boku no kanojo ni natte kudasai.” = Please be my girlfriend. I see, so you can’t say someone is your koibito just because you love her/him without knowing their feeling toward us? And Maggie-sensei, sorry for the bad grammar. English isn’t my first language. So you might be confused to understand what i meant. What i really wanted to ask is, can we use 恋人 to describe someone relationship other than lovers/boyfriend? Because in a light novel i have been read, the main lead guy is called as the second lead female’s ‘yuujin and koibito’ by the narrator. But from the story, we can exactly tell that the main lead guy is in love with another woman. Of course this second lead female is deeply in love with the main lead guy. So, can we interpret the ‘koibito’ that’s used by narrator as a beloved? My answer is the same. I don’t know the story so I can’t give you more information but you may find some hidden facts while the story develops. I guess it’s because ” 好き ( = suki)” already have a meaning of “I love you” besides “I like something”, you don’t need to　add “dai”. Also we say “daisuki” too casually when you talk about food, games, things or some preferences, etc. Of course, 大好き ( = daisuki) can sounds much stronger than 好き ( = suki) depends on how you deliver the speech. Naruhodo Alright, sensei. Arigatou gozaimasu That’s so helpful! キミを待っている　I will wait for you. So キミを大好きなまま modifies that line. I will wait for you loving you. You need a verb after that. Oh no. I think I made a mistake with my writing haha sorry sensei. It’s supposed to be like this キミ大好きなまま. Hi, Maggie-sensei. I want to ask a question. How about 君を大好きなママ? Is it same as I love you? Thank you for the lesson! I just wanted to know, would it be more common to use (as a young girl toward her boyfriend in public) 「ねえ、私のこと大好き？」as opposed to 「ねえ、私のこと愛してる？」? I would say 「私のこと好き？」instead of 大好き. as well thank you for all the effort you put in your lessons they are a huge help!! Hi, Maggie-sensei, you’ve got quite detailed lessons here, thank you very much. I came across phrase “スキあい” in manga I’m reading now and I suspect that it has nothing to be with love (it has been used in child’s play). Am I right or not? What does it mean? I will figure that out. Sorry, that’s it – the whole sentence Maybe the story can help? The highschool boy and girl are standing really close to each other face to face, the boy is going to say something but that girl’s little brother suddenly jumps on him shouting スキあい. Can you check if it is スキあり not スキあい. If it is スキあり(隙あり） it totally makes sense. It means “chink in one’s armor (armour)” which we say when we attack someone when you find their weak spot that shows and opening for attack. Thank you very much, Maggie! It makes sense! Font is styled to look like handwriting, so for me last symbol looked totally like い! But now I see that 2nd stroke much longer (sigh). So happy to see your website! You see, I was writing an anime fanfiction, and I’m trying to learn more japanese. What does this phrase mean in japanese: “Complete my heart/Complete this heart of mine” ? What does this phrase mean in japanese: “Complete my heart/Complete this heart of mine” ? You mean how to say that line in Japanese? There is no direct translation. You could translate it literally but it sounds unnatural. May I ask how strong is the word “恋人” ? Oh don’t worry! She just reacted because she is jealous. 恋人 is an exclusive relationship. She would still react if you change it to ~君の彼女（カノジョ）~’s girlfriend. I’m so glad to have found your site! It’s very informative and I have learned a lot from you. So say that someone you met online (but haven’t met in person) tells you “あなたのことが気になるよ”. To my understanding “気になる” could also mean “I like you” or “I’m curious/interested about/in you”. Is that right? Then I want to ask this person, “Why are you interested in me?” Previously you went over the phrase “どうして私のことが好きなの？” but what are some other ways to ask this question without using the word “好き”? I think “好き” is too strong a word to use in this case. Would any of these phrases work? What would sound more natural? I also don’t want to sound too direct or rude. I am glad that you found my site as well. Or if you feel happy, just tell him 私のことが気になると聞いて嬉しいです。without asking a question. Hi! Thank you for all your hardwork! It helps me a lot! But it doesn’t sound natural. Thank you for teaching us so many useful phrases. I’m a French woman and currently learning Japanese. I often pick up sentences and/or explanations on your blog. I was looking for some sentences to express how glad I am to have met a Japanese man who became my close friend. It’s not about a love relationship so the vocabulary of this lesson doesn’t fit. We’re both a little over 40 and never met physically, we exchange e-mails to improve our language skills. I’m looking for sentences such as:I’m glad we got to know each other. I’m happy we can talk freely and understand each other, your friendship and trust are important to me…. I want to send him an handmade card to thank him because he always helps me with Japanese and he also comforted me at a difficult time in my life. Bonjour Carine! Thank you for visiting our site. It seems like you found a nice Japanese friend. =Itsumo nihongo wo oshiete kurete arigatou. Soshite itsumo sasaete kurete arigatou. (Name) no okage de tsurai kotomo norikoete kuru koto ga dekimashita. Kokoro kara kansha shiteimasu. = Thank you for always teaching me Japanese. And thank you for your support. Thank to (name), I could overcome the hardship. Thank you from the bottom of　my heart. Hello Maggie Sensei! Ogenki desu ka? Thank you for your wonderful blog! Like Corine, I am in my 40s and have a Japanese male friend of the same age with whom a correspond from time to time. In my case, we have met in person a few times in Japan and are close enough for public hugging, but it is not a romantic relationship. He does not speak much English and I am only a beginner at Japanese so we do not write long notes and I always have to use a dictionary, but it is extremely helpful for me to practice reading Japanese characters and understand colloquial phrases (our correspondence is not formal). Sometimes a friend translates, but I would like to be able to express some forms of friendly affection on my own, as that seems more personal. For instance, it would be nice to express that I miss his company (I am never sure if words such as “aitai” are suited to friendship) or how much I appreciate him as a person/apprecite his correspondence. Also he has some health issues, and I am often at a loss how to express concern and caring in a personal way without being formal. It would be super if you could do a lesson on expressing affection/caring on a friendship level one day! I think I got the similar request in past. Was it you? Well, everybody has different type of friendship so it would be hard to make a general friendship lesson but will keep it in mind. or how much I appreciate him as a person/apprecite his correspondence. Your correspondence is by email or letters? Also he has some health issues, and I am often at a loss how to express concern and caring in a personal way without being formal. No, it was not me. Perhaps there are many people who have non-romantic close friendships reading your blog! :-D I agree that it is difficult though, as there are many degrees of friendship. Can you explain 無理はしないでね? Is it a way of saying “take care of yourself?” I love to read your explanations of the differences in saying things in Japanese, it’s very helpful to a beginner. hey maggie, i know its kinda late but thank you for taking the time to make this blog. I’ve recently gotten my heart broken by an ex who was japanese.. and i’d like to know how to tell him that i miss him dearly and im thinking about him, but want to make it really short, sweet but powerful. how would i go on about saying this? Hello kitten, thank you for visiting this site. Hmmm it is a tough request because I don’t know his personality. But let me give you a couple of example sentences so that you can use a part of them. = It has been ~ months(~ year(s) since we decided not see each other anymore. = I thought I was over you but I can not forget about you. = I still have a (strong) feeling for you. = I still love you. = I would be very happy if you have some kind of feelings towards me. Maggie sensei can I ask how do you translate Kimi no koto nante? It seems like an unfinished sentence. Ex. 君のことなんて知らない。= Kimi no koto nante shiranai. = I don’t know YOU! If you want to learn more about the function of なんて=nante, go check this lesson. Ex. 君のことなんてきらいだ。= Kimi no koto nante kiraida. = I don’t like you. I have to make a Japanese poem for our class but there’s a phrase that I cannot translate. Could you help me? How do you say: “I realize how much I love you and this rainy season” in Japanese? Wow. I had to decipher your writing. = Boku okaasan no koto..
We often leave the sentence unfinished on purpose in Japanese. So you have to read between the lines. But it depends on the context. I’m a male and I’ve taken a liking to someone (a girl xD) and I want to tell her I like her. I enjoy talking to her and I want to know more about her. I hope you can help me. PS: I love your posts! So you want to know how to telling someone verbally in a subtle way. As I wrote in this lesson, telling someone 好きです is very straight forward. If you keep asking her out, she will get a hint. = Kondo futari kiri de aenai kanaa. = Is it possible to go out just you and me? You can give her compliments. = A chan wa hontou ni kawaiine. = You are so cute, A-chan. = I kind of think of you often lately. = A chan wa boku no riosu no taipu nan dayone. = You are my ideal type, you know. = A chan no koto ga suki ni nacchatta kamo shirenai. See we have lots of vague ways to confess our love. I’m doing my best in regards to the complimenting but there’s still the fear of feelings not going to be reciprocated but I’ll work hard! Hmm, I forgot to include it in first post but if it’s someone you meet online or through SMS, will the approach be very different? I really am falling for her but I don’t know what to do aside from telling her my feelings. We have received all your comments. So you just know her on line? = Line de shika A-chan no koto wo shiranai keredomo mou zutto shitte iru you na ki ga shimasu. = I only know you on LINE but I feel like I have known you for a long time. But if you haven’t seen her yet, then you should see her in person first and then tell her how you feel. = Ichido atte moraemasu ka? = Is it possible to see me in person once? How should I say these things? I can help you but do you want to try translating the sentences first? Yes. That way you can learn Japanese better. I hope I was able to translate it correctly. How do you say “I think I am in love with some one, what should I do?” in japanese? 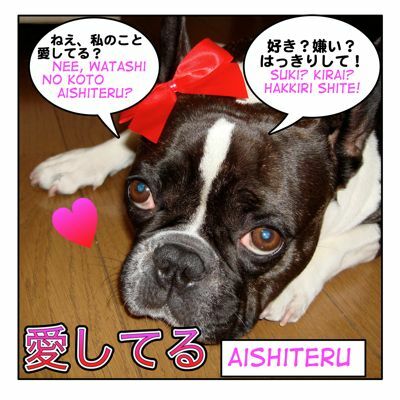 Can “Aishiteru” use with Family member? Ex. If I want to Post in my mother’s facebook on haha no hi that…Okaasan, itsumademo aishiteru yo., is this phrase can be use to tell mom that I love her? Or it’s suitable to say “Daisuki” with Family member b’coz I’ve searched in the internet that Aishiteru like a affair word, can’t use with mom or dad or any family members but some websites said that it’s ok to use with family member. Many Thanks for your kind help in this matter. Daisuki is more common and sound lighter but I am sure your mother will be very happy to see your heartwarming message either way. Japanese people are not good at expressing our love even towards our family or even our sweethearts. But I am sure she knows you can express your love openly so that’s perfectly all right. I think it is very lovely. In Japan (of course it depends on the family but) grownups don’t express their love towards their parents, children saying “daisuki / Aishiteimasu” verbally in daily life. Sensei, can you tell me how to say “I have fallen in love with someone else” in Japanese? Both in a formal and informal way? The literal translation is 他の人を好きになりました。but I will teach you more natural Japanese here. Oh, sensei, I remember reading a blog post somewhere saying that the word for “love” doesn’t exist in ancient times in Japan? Is that true? I thought 愛 is an old word because it’s the same as Chinese. Or maybe it’s not used in ancient Japanese era? ずっと愛してるよ (=Zutto aishiteruyo) means “I will love you forever.” and it is a phrase to tell someone so it is heavy. can you use this like in english after seeing a girl a couple of times to let a girl know you are interested in seeing her romantically? Well Michael, in my opinion you can safely use 君のことが好き（です）. Maggie, would you agree with me? So in that sense it is strong. But it depends on your relationship. If you want to tell her you really like her, you can say that. If you are not that ready yet, you can deliver your feelings in a subtle way like. Or all sorts of compliments will tell her you are interested in her. Then when you are ready, you can tell her 好きです. こんばんは sensei! how do you say ‘..because i know that you love me’ in nihongo? You can also use 知っている instead of 分かっている. I want to know in joke and in being serious, and also in both genders and by the way can you translate into Romanji? thanks a lot. I am sorry but I don’t quite get what you want to know. Jokes in Japanese related to love? OK, I will type it again with romaji. how do you say “if you’re like this, i might fall for you” in japanese? I have only learned “I hope” and “(something) was supposed to be the case” so I don’t know how to express my wish for something that is impossible, or unlikely to happen. I will make a short lesson on Facebook sometime. for this lesson, if i want to say “i can’t accept your feelings”..
“anata no kimochi ga dekinai yo”? Hi peko-chin! Kawaii? Thank you!! !heart! I can only love taller guys. I’m glad to hear you like my mini lessons! 彼のことをずっと考えています。= Kare no koto wo zutto kangaete imasu. 私もあの人に同じ様な気持ちを持っています。= Watashi mo anohito ni onajiyouna kimochi wo motte imasu. 私もあの人に同じ様な気持ちを感じています。= Watashi mo anohito ni onajiyouna kimochi wo kanjite imasu. Heya Maggie-sensei, I have a question and I’m sure I’m right about this, but I wanted to run this by you, because I am not 100% sure I am. >.< and I studied myself for years off sites like yours and a couple other genuine sensei's and barely now I am taking free online course at YesJapan and another one via mobile call Human Japanese. But I am still very unsure of my knowledge. I want to write 'I'm not in love'. I've heard the line said in my favorite BL anime,Sekai-ichi Hatsukoi. But it's different then what I want. There's is more of the freaking out I'm not in love – this is not love, kinda thing. は (Wa) as in the particle that expresses the Listener knows who the speaker is referring to as well as stating you do not like or in this case the speaker is saying he isn't in love. を (wo) would normally changed to Wa if you wanted to emphasize the fact. But he isn't trying to, because the truth he knows he's in love. Kind of like he's ashamed to admit but ashamed that he can't go out and just say he is, I guess. That's why you put をし meaning to be regrettable or disappointing in the fact. てな it's used after a phrase right? To modify a noun and い used to express the thoughts and feelings?? I really hope I didn't do to bad and I really hope you can help. Thank you for taking the time to read this. You got more or less except the way you separate the sentence. Oh, I see where I went wrong . . . -Sighs- Study is so much easier then putting everything together. I’m sorry for messing that up and again thank you so very much for helping me, from the bottom of my heart, really. I’ve always wanted to learn but I has a horrible student as a kid. How do you say that you have a secret crush? = (Kakushite iru keredo) Hontou wa kare no koto sukinandesho! = (Kakushite iru keredo) Hontou wa kare ni ki ga arun desho! = (Kakushite iru keredo) Hontou wa kare no koto suki nan daro. =(Kakushite iru keredo) Hontou wa kare ni ki ga arun daro! Hello, I love your page. It took me insanley long to find something on “love”. When I reseached, the results were all confusing and didnt seem right (my instincs kicked in haha) I found a video which helped a little, but your page really broke it down! Hi, Twix! I am very happy that you found our site following your instinct! You can’t say that in one sentence. It will be two sentences but…. FYI There a couple of ways to say “I miss you” in Japanese. = Anataga soba ni inai kara samishii desu. = Anataga inai to samishii desu. = Anatani aenakute samishii desu. And I put あなた for the pronoun, “you” but you can use her/his name. This helped me a lot, after hours of searching. Hope you visit us again and again! Is it something like ‘love of my life’? It was on a letter, so in English, it would look something like: “To the love of my life” (like a love letter or a Valentine’s Day card). 俺の人生の愛 sounds a bit strange to address someone because it also means “love in my life” but it is possible to use as “love of my life”. Check it again if you still have the manga to see if it says 俺の人生の愛 and let me know. How do I say “a person that is loving” or “a person that loves”? How does one say “a premonition of lovers” as in “a premonition that belongs to the lovers”? Do I simply invert the order to “Yokan no koibitotachi”? a) Does this mean “that one loses one’s cool because of love” or that “for the sake of love one lose’s one’s cool”? b) Could sensei give me another couple of examples that use this no + kara combination? Sensei I looked up the word “yaro” and found it means “it seems”. Does this mean that the above sentence could be also translated to: “(If you are so sweet to me) it seems I can’t help falling in love with you.”? 5) Sensei some time ago I came across the expression “suki de iru”. a) Does this expression mean “being in love”? b) Is it possible to use this (i)stem + de pattern in other sentences like for example: “onaka ga suki de iru”? Just to make sure sensei, when we talk about going out in this context we are talking about getting to the beginning of a relationship of some kind, like something before being a couple. In other words, that there would be a mutual understanding that both parties are interested in each other. It doesn’t involve the literal meaning of going out somewhere, like to watch a movie or something, right? Now I am even studying the comment section sensei! XD And I used to think some of the lessons from Maggiesensei were long… XD It is all good study though so I am not complaining. Does the above sentence mean “This time it isn’t that long so it is an exemption.”? Sensei I don’t recall seeing this “yatte tsukau” pattern before. I guess “yatte” is the -te form of “yaru”. Does this “yatte tsukau” pairing imply something we could translate to “make use” in English. Good, now you have been studying about “Love” !heart! OK, let me answer your questions one by one. →It works for both ways but you should clarify who loves who. And usually the later translation is more common. Since this movie is about two people who we expect them to be a couple, I guess they put that title. 恋人たち(=同士)になる予感 is more accurate title. 4) This Osaka dialect やろ is equivalent of でしょう／でしょ／ではありませんか and used when you make your point. b) “onaka ga suki de iru” doesn’t work. when you are talking to your big fan or someone who is crazy about you. 7)You can always observe how the person addresses you and how she changes the way she talks to you. If you feel it is getting closer, you can adjust to it. If you are talking to the same age people, being overly polite will put some distance between you two. On the contrary, if she is talking to you politely and you keep talking to her too casually, she might think you are shallow. 8) Yes that is right. But some people say this phrase without knowing that person so well even if they have never dated before. Hahaha, you are an ideal student! Since it (the translation you asked me) is not that long this time, I will make an exception for you. どうやって払うの？= How do we pay? どうやって勉強したらいいですか？= How should I study? どうやって駅に行ったらいいかわからない。= I don’t know how to get to the station. No problem! Hope I answered all your questions. Sensei I think I got it. But outside of the verb “suru”, when it comes to other verbs, would there be a more marked difference when one uses intransitive and transitive verbs to describe the action of a person? Like for example, pardon me sensei if this doesn’t make sense, ok? I bet those sentence don’t make any sense but maybe sensei will understand. Oh, I completely forgot about that “kara” meaning. ^^’ So the sentence could actually mean: “Love and it’s getting crazy for nothing”, right sensei? So this would mean: “have been fine/have been ok”? A) So, is it expected for men to be the ones to drop polite first? B) If I get this right, once I drop polite she would also drop polite and if she doesn’t it means I am being considered shallow. C) Are there women that never drop polite in Japan? Thank you sensei, the other questions are clearer than a cleaned piece of glass. →If you are talking about the difference between transitive verbs and intransitive verbs, yes, there are lots of verbs which have different meanings. This could be your next lesson to study. Not necessary. It could be a girl who drop the politeness first. she respects you or she wants to put the distance between you. Thank you very much sensei. Hi Yuki-chan!! Sorry for the late response. I was on vacation now. Genki desuyo! Yukichan wa? I’m sorry but I just want to stay friends. Please please please please please help me! Maggie…I have this guy friend that told me to figure out what this phrase thingy means! I have searched and searched! What does “anata niwa unzari shiteiru” mean in English? anata ni wa unzari shiteiru = I am sick of you/I am fed up with you. You can change 君 to あなた. But it is more common to use the person’s name. Also the translation changes depending on how close you are to the person. How do you say “Why do you love me?” in japanese? = Doushite watashi no koto ga suki nano? = Doushite watashi no koto wo aisshite iruno? = Doushite boku no koto ga suki nano? = Doushite boku no koto wo aishite iru no? Ah, thank you! Um.. Sorry for being a bit annoying, but..
= Arigatou. Anata no kimochi totemo ureshii desu. Nee watashi doko ga suki? Sugoku shiritai desu. I don’t get why you wrote “I’m sorry” in the end. I don’t think you need to apologize… Anyway, I hope this helps. Your blog is very interesting! I hope you could help me! First thank you for finding this site! Hope you learn some. I help people who have a Japanese question here but I don’t usually do translation. thanks for taking the time to do that! It’s actually really informative. lol. How would someone say “don’t fall in love with me.” in a joking manner? ?? Do you want to try again? Will help you. I do have one question though. In casual settings, when a female speaker is asking a question, sometimes I hear her end it in 「の」. When is it appropriate to use it versus leaving it out altogether? Hum..I wonder which の you are talking about. の ending is very common among men as well. 今夜どこに行くの？= Where are you going tonight? 何を食べるの？= What are you going to eat? これどうやって使うの？= How do you use this? All of these can be said without の. Adding の makes the sentence sound a bit stronger. Actually, that sounds like the の I was talking about. For some reason, I read somewhere that sometimes it’s considered feminine speech when you end certain kinds of questions with の. I must be mistaken. But anyway, thanks for clearing that up for me. I love the Japanese language and hope that someday I can become fluent. Love your lessons and look forward to the next one! Can I used taisetsu na hito for closed friend and family member? Usually 大切な人 refers to one’s significant other, one’s loved one. But yes, you can refer to your family or friend as 大切な人,too! = Kono hoken wa anata no taisetsu na hito wo mamorimasu. 質問があったらいつでも聞いてね！= Shitsumon ga attara itsudemo kiitene! = Feel free to ask me questions anytime! Thanks for this lesson ..
how to say , “but i dont love you” ? thanks maggie sensei :D love the lesson ! Thank you for visiting this site! ow.. thank you for the answer. but how i say it? “Demo watashi wa aishite inai” ? As I wrote in the earlier comment, it changes slightly depending on your gender. Demo watashi wa anata wo aishite inai. Demo watashi wa anata ga sukijanai. Demo watashi wa anata no koto sukijanai. Demo watashi wa anata no koto aishite inai. Demo boku wa kimi no koto aishite inai. Demo boku wa kimi no koto sukijanai. Great lesson! And now i finally get the difference between 好き and 愛す　and 恋する, because i was always wondering… In my language, we also have differents verbs for loving smb deeply (and we rarely use that) like 愛す and loving like 好き, and be in love like 恋する. マギーのことすごくすきだよ！Can I say that to a dog…? マギーのことすごくすきだよ！Can I say that to a dog…?→Sure you can! It is perfect and I am very happy to hear that! I would looove to see your doggie! Send me a picture if you can! (action@k3.dion.ne.jp) Sometimes I make a guest teacher lesson using my other friends! Hey Yukari, sorry about the confusion. I love your guys’ work! Don’t worry. Many people get confused as well and I still love you! How about terms of endearment? Are there any and if so, what kind? Great Lesson btw, thank you very much! Good question but I am afraid to say we don’t have many terms of endearment. Instead, for example you call a girl with “chan”, ex. マギーちゃん when you get closer to the girl or when you text, you use ♥ marks more. Some women call their husband with あなた（=anata) with certain intonation. I guess everything is so subtle in Japan. Thanks so much for all your hard work, it’s really appreciated. Thank YOU for visiting this site! And I appreciate it,too!! Hey Victor, is the voice for maggie your wife? Sorry! I am NOT Victor’s wife. I(Yukari) make this blog with Maggie. Victor is promoting this site! should be understood better as: “You can not (do) trust”. Someone who can not be confident or faithful or handle trust is someone who cannot be trusted. But in English this is best rendered “I cannot trust you”. So, “anata/you” is the subject in Japanese, but “I” in English. We often omit subjects in Japanese so it might be confusing. So it means I can’t trust you. This が comes before the object. あなたが好き。。。でわない。　（Or something to that effect)To mess with her. Is there a way to say love-negatively like that?